Patrick and JB don't know why this is happening and are just going to wait here until this passes. JB - you should watch Emelie. It's really good. I felt the same way about Road Games, Patrick, and you put it really well. Once the twists start kicking in I felt played and not in a fun way. I lost interest and was pretty bored. Crampton kept me in though. (What the hell was that after credit scene, btw? Seemed pointless.) Also, the lead actor was really bad and he was distracting. That lead French actress was smokin' hot until I found out she's married to the Uptown Funk guy. 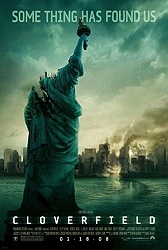 I like Cloverfield and I agree it's one of the few FF films that gets it right. You guys revisiting it in detail reminds me of how well done the majority of the film is. (I think only Chronicle, technically speaking, beats it but the rules they establish in that film allow them much more freedom in the FF format.) I'm not crazy about the first 20 minutes. I get they have to set up some character depth and try to get you to care but it was having the opposite effect on me where I was saying "I gotta spend the whole movie with these people?!". Luckily, the balcony scene comes quick enough and I realize I don't really care. Side note: Best tunnel scenes in Horror? That's a good topic for later discussion. "Disappointed I didn't get any A[--]" pretty much sums up my high school experience. Great podcast guys, I was going to be rewatching this soon in anticipation of 10 Cloverfield Lane which I'll say again had one of the most anticipation-inducing teasers I've ever seen. I'm with yas - I think it's great and, like Patrick, remember thinking that the found-footage giant monster movie concept was brilliant and I was not disappointed - one of the few movies I saw in a theatre that year. Here's hoping we aren't disappointed in 10CL! "It is the enemy of entertainment" is my new favorite saying. Thank you for that, Patrick. Ooooh! Awesome. Haven't listened to this yet but I was already planning on rewatching the movie so definitely giving this a listen before going to see 10 Cloverfield Lane on Friday. Got my IMAX tickets! Hope there's no mention of speculation about how the two movies are or aren't connected - cause I've been trying to avoid everything possible. Anyway I'm excited about this one! Are you guys thinking of "I am Legend" as the other movie? Apologies if someone has already mentioned this. A number of people have made that connection. I feel like a crazy person because I only saw I Am Legend once and have a hard time accepting that I remember that scene so well, but it must be it? same here, haven't seen I am legend since it was in theaters. I think in the movie its replayed a few times in sort of a reoccurring flashback. We had a ton of people throw up in the auditorium during the opening weekend for Cloverfield at the theater where I work. That Saturday in fact, literally every showtime at least one person threw up in there. I've never revisited Cloverfield once it left the theater since a lot of the fun for me was the roller coaster ride feeling of seeing it on the big screen. I do remember being a bit annoyed that pretty much the whole first reel of the movie was spent showing these characters at the party. None of them ever really felt real to me in the way that you would expect from a found footage movie. They just felt a lot like TV characters for me. Once the action picked up I enjoyed the movie quite a bit, even though I never warmed to the characters. The only other issue I had was once they rescued the girlfriend who had just spent several hours impaled she seems to be able to walk it off fairly well. It's a bit of a nitpick, but it was in the back of my mind throughout the rest of the movie. Patrick, I felt the exact same way during that epic fire fight. Great show. I had zero interest in watching Cloverfield again but this conversation definitely has me wanting to revisit it. Doesnt independence day have a scene where theyre gonna put bill pullman on a helicopter but then dont and it explodes, then he ends up on air force one instead? Thats the first thing i thought of but i might be remembering that scene wrong. Patrick, when you mentioned the Jurassic Park velociraptor effect (where the big monster in a monster movie is accompanied by a swarm of smaller threats), and you mentioned Godzilla and Cloverfield, my mind went to Pacific Rim. Wondering if that's the last movie you were thinking of.